"There's been a great deal of scholarly and policy attention toward incarceration, and rightfully so, as it has very distinct consequences for people that have that experience, as well as their communities and families." — Sarah Shannon, assistant professor of sociology in the Franklin College of Arts and Sciences and first author on the study. Estimates reflect racial disparities in felony convictions during era of mass incarceration. New research led by a University of Georgia sociologist on the growth in the scope and scale of felony convictions finds that, as of 2010, 3 percent of the total U.S. population and 15 percent of the African-American male population have served time in prison. People with felony convictions more broadly account for 8 percent of the overall population and 33 percent of the African-American male population. 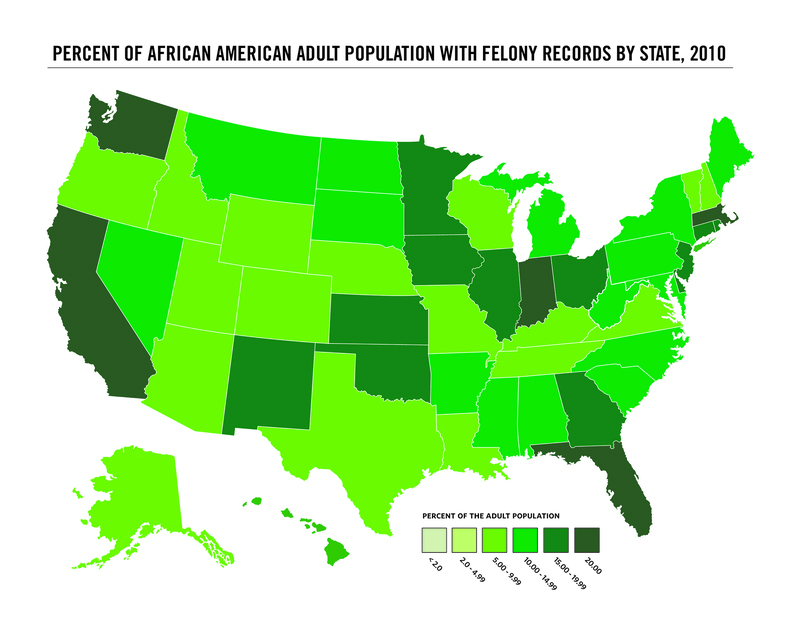 The study includes the first estimates of the felony conviction population and maps their distribution in the states, documenting the dramatic growth since 1980. “There’s been a great deal of scholarly and policy attention toward incarceration, and rightfully so, as it has very distinct consequences for people that have that experience, as well as their communities and families,” said Sarah Shannon, assistant professor of sociology in the Franklin College of Arts and Sciences and first author on the study. “But the larger population who also have felony convictions face many of the same types of stigma that come with having been incarcerated-lack of access to jobs, lack of access to housing and welfare support-without necessarily having had the experience of spending time behind bars,” she said. Because the U.S. does not maintain a registry of data on people with felony convictions, researchers calculated estimates based on year-by-year data, and used demographic methods to estimate the numbers of deaths and re-incarceration to establish a number for each state and year. “In our communities all over the country people are living, working, paying taxes, or otherwise getting by all while facing the consequences of criminal justice experience that limit their life chances and also have spillover effects into our other social institutions,” Shannon said. Because states differ on how they report statistics to the Bureau of Justice Statistics and on other measures such as recidivism, the researchers present ranges to reflect error and uncertainty in the data. “Though the data have improved over time, the lack of quality and consistency in the data can make it difficult to examine the full scope and scale of our criminal justice system. This is especially true in the case of race and ethnicity.” Shannon said. Historically, data have included race in terms of whites and African-Americans. But states differ in how and whether they define Hispanic and Latino ethnicity. Broader explanations for growth trends center on policy responses that occurred as a part of the war on drugs and other sentencing changes beginning in the 1970s that increased the likelihood of incarceration and criminal justice supervision. Mandatory minimum sentencing laws, truth in sentencing laws, and the three-strikes law, for example, increased the population in prisons. Political dynamics resulting in more aggressive enforcement and zealous prosecution contribute to higher rates of felony convictions, but also play a role in efforts to reduce prison populations. Co-authors on the study include Christopher Uggen, Regents Professor and Distinguished McKnight Professor of sociology and law at the University of Minnesota; Jason Schnittker, professor of sociology at the University of Pennsylvania; Melissa Thompson, associate professor of sociology, Portland State University; Sara Wakefield, associate professor of criminal justice, Rutgers University; and Michael Massoglia, Romnes Professor of Sociology at the University of Wisconsin-Madison.